Back in 2004, I wrote an article about Dragonlance Sorcerers and Identity. In my article, I compared the sorcerer to the Wizard of High Sorcery and talked about what could be done to make sorcerers more interesting. Now it’s 2018, and we are two editions beyond the time that article was written. I wanted to look back to see if any progress had been made, and where we could go from here. I still maintain that the Wizards of High Sorcery are the most iconic arcane spellcasting class in Dragonlance. Due to their iconic status, there cannot be another arcane archetype that even compares to them. So perhaps one shouldn’t do that. Maybe we should focus instead on creating some sorcerer archetypes to make them a viable alternative at character creation. I feel that part of what makes a sorcerer special is their independence. The days of the Academy of Sorcery are gone, replaced by a master/apprentice relationship. 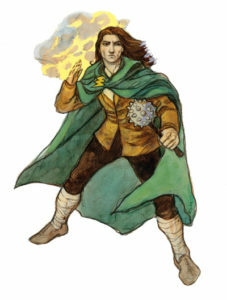 The Academy Sorcerer archetype remains rather ineffective in the modern era of Dragonlance. Previously I mentioned that sorcerers could join the Legion of Steel or the Knights of Neraka, but developments in D&D has changed my mind on this topic. Thorn Knights are better suited to be hexblade warlocks in 5th edition terms. This leaves the Legion of Steel, which is a nice fit. Dungeons & Dragons 5th edition has several new subclass options for the sorcerer, including the divine soul (mystic? ), draconic bloodline, shadow magic, storm sorcery, and wild magic. Wild magic, in particular, works quite well as it gives you a sense of what happens when magic is not fully under control. Wild mage sorcerers would be the most common type in Krynn, in my opinion. Shadow magic would be good to represent the Shadow Sorcerer, and storm sorcery would be good to represent Finkle of the Green Robes. I do hope that we will see an elemental sorcerer someday. Metamagic has been incorporated into the sorcerer, which fits thematically well with the theme of spellshaping from the Fifth Age products. Plus, the sorcerer now has its own spell list, providing even more separation from the wizard. What of the dragon mage role in SAGA? Honestly, I feel that it is overpowered to have a “pet dragon.” I feel like the concept of the dragon mage fits the warlock class a bit better. If you do want to have a draconic aspect to your character, the draconic bloodline option is spot on. All in all, we’re headed in the right direction. I feel that sorcerers are now distinct from the wizard, though not nearly as iconic. And that’s okay. The sorcerer should prove to be a fun class option for Dungeons & Dragons 5th edition players. I think dragonlance is the best setting for Sorcerers because of their relationship with the Wizards of High Sorcery. Any new DL material needs to play up the fact that Sorcerers are always kind of “on the run” from High Wizards. It seems like in the later novels that relationship has softened, but i would like to see it played up a bit more. Maybe now that the orders have separated the Red Wizards could be written to take more offense to the existence of sorcerers. They always seemed like they lacked a cause to get behind. In my Dragonlance campaign that I run, sorcerers are considered renegades and most of them have been united into a faction led by a lich that seeks nothing but the utter destruction of the Wizards of High Sorcery. A warrior must get used to such things. — Tanin Majere , The Second Generation, Wanna Bet?